The Samana Peninsula is a range of lush forested mountains to the Northeast of the Dominican Republic, enclosing Samana Bay, with its transparent blue waters and soft caressing waves, its romantic coves and inviting virgin beaches. 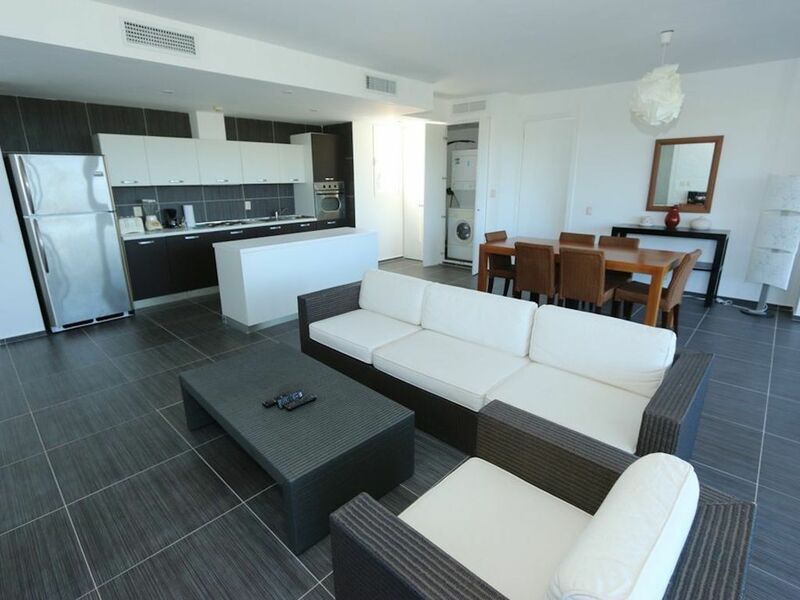 This one bedroom apartment , in the Vista Mare gated community, offers incredible views to the Bay and all the comfort you expect in your own home.As our guest you will have free access to Gym, Pool, Restaurant and other facilities located at the Club house. There is a 24 hours reception to take care of any request you may have. This apartment has two bedrooms.When selecting the ONE bedroom option, the second bedroom will be locked. The advantage is that you will continue using the complete living room and this way you will get the largest one bedroom apartment available in this complex. Bathroom with shower, toilet and sink. Hair drier and basic toiletry and towels provided on arrival. Bring your own dishwasher and laundry pots since they are hard to find locally. Bring your own dishwasher and laundry pots since they are hard to find in Samana. The dining table is located in the open space including living room and kitchen. Open area design. There are sliding doors connecting these areas to the exterior partially covered deck/terrace. Mostly Spanish channels but a few English, one French, one Italian. The deck/Terrace runs along the complete front of the apartment, overlooking the Bay of Samana.This is the ground floor. This apartment is one level below the access level which is the second floor from the parking but it is the ground floor in the side overlooking the ocean. The Jacuzzi in the deck/terrace is not heated. Is just for refreshing yourself on a very hot day. Will be covered and empty since is a health risk leaving water and becoming breathing area for mosquitoes. Ask for assistance to reception for filling with water or emptying it. Do not do it by yourself because you may burn the pump.